There are many techniques for transferring images and words onto promotional products. Follow the guide below to learn about the various ways to create promotional items custom-decorated with your logo. If you have a question, don't hesitate to give us a call at 1.714.556.2300. Screen Printing/Silk-Screening: an ink image on paper or textiles. First your image is turned into a film positive. The film positive is "developed" onto light-sensitive emulsion spread on a screen—when exposed to light, the emulsion covered by the dark parts of the image stays soft, and is easily washed away creating a negative of the image. Ink is pressed through the emulsion negative, transferring your image to a paper or cloth surface. This is the classic way to create promotional t-shirts. Multi-colored images require multiple screens, and the colors are printed one at a time. Embroidery: stitching on textiles. Your artwork is digitized using a special program that converts the image into patterns of stitches. 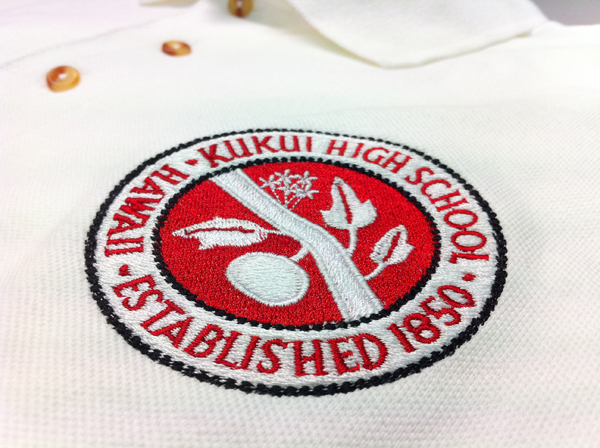 The program directs a specialized embroidery sewing machine to stitch the pattern using stitch sizes, shapes, and colors that will recreate your image, custom applied to the textile of your choice. Promotional hats may be silk-screened or embroidered, depending on the effect you want. Deboss: a depressed image in paper, leather, or plastic. A custom metal die is created from your image. The die is pressed into the material’s surface, creating a lowered imprint. It is a imprinted stamp of your image usually without ink. Emboss: a raised image in paper, plastic, or leather sheets. A custom die is made for your image, and pressed into a material’s surface from below, creating a raised image. An embossed image may be inked or not, for various effects. Hot Stamp: heated debossing. A custom die of your image is heated and pressed into the printing surface. This allows debossing to be done in harder materials, such as metals. Etching: printing from a custom metal plate. A metal plate is covered with an acid-resistant material in the pattern of your image. Then the plate is immersed in an acid bath, eating away unprotected metal and leaving your image etched onto the plate. Ink is applied to the plate to produce custom prints of your image onto metal, glass, or film. Foil Stamp: metallic printing, usually debossed. Using the same method as basic letterpress printing, using foil in place of ink and applied with heat. From a custom die, your image is stamped into vinyl, leather, or paper surfaces. Many colors of foil can be used for various effects. Die-casting: molds. Molten metal is injected into a carved die, creating the finished product. Die-striking: image pressed into metal. A craftsman renders your design in a soft piece of metal that is then hardened, producing a custom die. The die is used to strike your design into a softer metal, usually brass. This process creates a classic, high quality finish, perfect for very special custom items. Color Fill: highlighting an engraved or etched area. Once your image is printed, engraved, or etched, a color fill can be used to highlight areas of the image. Pad Printing: perfect for printing onto plastic. Your image is photo-etched onto a plate. The image is inked, and then lifted onto a silicone pad that transfers the ink onto the desired product. The pad can wrap itself around small objects, into any nooks and crannies, and gives excellent ink coverage. Four-color printing is possible. This is an excellent technique for customizing plastic items; a simple way to mass-produce your promotional products. Laser Engraving: cut away images or text. A custom template is made from your image or lettering. Lasers directed through openings in the template make clean cuts through a sheet of paper, metal, or plastic, actually evaporating it. 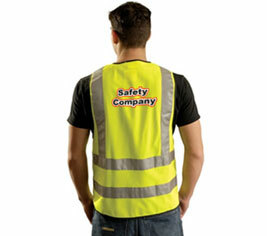 The result is a stylish, custom cut out of your message or logo. Sublimation: permanent images on porous products. Your message, graphic, or photograph is imprinted using heat-activated dyes. The dye is permanently embedded into the material, absorbed into the pores of the fabric or other material, rather than sitting on top. Used for mouse pads, mugs, T-shirts, caps, and trophies. Offset Printing: high quality ink printing. From a custom-made metal plate, the ink is transferred to a "blanket" or rubber-covered cylinder before being pressed to paper. This is a technique for high quality printings of more complex images. Decal: custom stickers. A custom label on special, transparent paper is created from your image, then applied to the product. Embedments: Materials such as a product replica, for example, are suspended in a clear substrate, usually Lucite or acrylic. The Pantone Color Matching System (PMS) is largely a standardized color reproduction system. By standardizing the colors, different manufacturers in different locations can all refer to the Pantone system to make sure colors match without direct contact with one another. One such use is standardizing colors in the CMYK process. 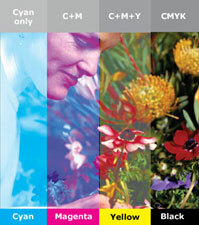 The CMYK process is a method of printing color by using four inks — cyan, magenta, yellow, and black. A majority of the world's printed material is produced using the CMYK process, and there is a special subset of Pantone colors that can be reproduced using CMYK. Those that are possible to simulate through the CMYK process are labeled as such within the company's guides. However, most of the Pantone system's 1,114 spot colors cannot be simulated with CMYK but with 13 base pigments (15 including white and black) mixed in specified amounts. The Pantone system also allows for many special colors to be produced, such as metallics and fluorescents. While most of the Pantone system colors are beyond the printed CMYK gamut, it was only in 2001 that Pantone began providing translations of their existing system with screen-based colors. (Screen-based colors use the RGB color model — red, green, blue — system to create various colors.) The Goe system has RGB and LAB values with each color. Pantone colors are described by their allocated number (typically referred to as, for example, "PMS 130"). PMS colors are almost always used in branding and have even found their way into government legislation and military standards (to describe the colors of flags and seals). In January 2003, the Scottish Parliament debated a petition (reference PE512) to refer to the blue in the Scottish flag (saltire) as "Pantone 300". Countries such as Canada and South Korea and organizations such as the FIA have also chosen to refer to specific Pantone colors to use when producing flags. U.S. states including Texas have set legislated PMS colors of their flags. It has also been used in an art project by the Brazilian photographer Angelica Dass which applies Pantone to the human skin color spectrum. Please see our online PMS Color Chart.